In sorting through some of my scrap stuff from last year I have found plenty of "extra" christmas cards...thought I would share a few of the ideas here. 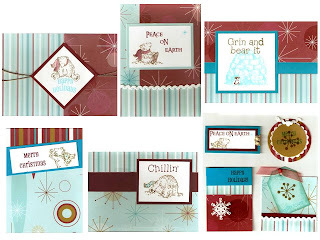 I used the Just Chillin' paper pack and "Chillin" stampset to create these gift tags and cards last year. These cards are created using the "Let us Adore Him" stampset and Everlasting Paper Pack with a little cranberry ribbon.